In the next installment of the "splendid memoir Roosevelt didn't get to write" (New York Times), Nigel Hamilton tells the astonishing story of FDR's year-long, defining battle with Churchill, as the war raged in Africa and Italy. 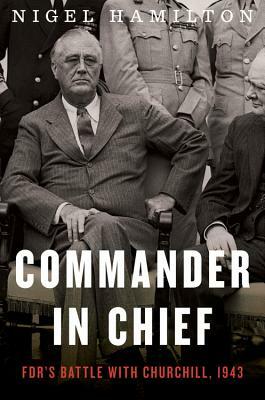 Nigel Hamilton's Mantle of Command, long-listed for the National Book Award, drew on years of archival research and interviews to portray FDR in a tight close up, as he determined Allied strategy in the crucial initial phases of World War II. Commander in Chief reveals the astonishing sequel — suppressed by Winston Churchill in his memoirs — of Roosevelt's battles with Churchill to maintain that strategy. Roosevelt knew that the Allies should take Sicily but avoid a wider battle in southern Europe, building experience but saving strength to invade France in early 1944. Churchill seemed to agree at Casablanca — only to undermine his own generals and the Allied command, testing Roosevelt’s patience to the limit. Churchill was afraid of the invasion planned for Normandy, and pushed instead for disastrous fighting in Italy, thereby almost losing the war for the Allies. In a dramatic showdown, FDR finally set the ultimate course for victory by making the ultimate threat. Commander in Chief shows FDR in top form at a crucial time in the modern history of the West. NIGEL HAMILTON is a best-selling and award-winning biographer of President John F. Kennedy, General Bernard “Monty” Montgomery, and President Bill Clinton, among other subjects. His most recent book, The Mantle of Command: FDR at War, 1941–1942, was long-listed for the National Book Award. He is a senior fellow at the McCormack Graduate School, University of Massachusetts, Boston and splits his time between Boston, Massachusetts and New Orleans, Louisiana.